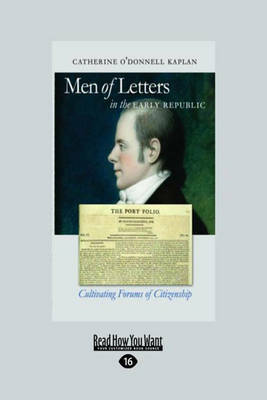 In the aftermath of the Revolutionary War, the role of the citizen was seen as largely political. But as Catherine O'Donnell Kaplan reveals, some Americans believed that neither the nation nor they themselves could achieve virtue and happiness through politics alone. Imagining a different kind of citizenship, they founded periodicals, circulated manuscripts, and conversed about poetry, art, and the nature of man. They pondered William Godwin and Edmund Burke more carefully than they did candidates for local elections and insisted other Americans should do so as well. Kaplan looks at three groups in particular: the Friendly Club in New York City, which revolved around Elihu Hubbard Smith, with collaborators such as William Dunlap and Charles Brockden Brown; the circle around Joseph Dennie, editor of two highly successful periodicals; and the Anthologists of the Boston Athenaeum. Trough these groups, Kaplan demonstrates, an enduring and influential model of the man of letters emerged in the first decade of the nineteenth century.